I’ve said it before (for instance, here) but it bears repeating: Thanksgiving is my favorite American holiday. I love everything about it, from the mythology to the mashed potatoes; from my family’s adherence to our culinary traditions (like this regional requisite) to the outlandish reinterpretations I’ve encountered elsewhere (like this ghastly gallinacean); from the nearly non-secular nature of the celebration to its unabashed, yet rational, nationalism; from its emphasis on amplitude and generosity to its freedom from mandatory “gifting,” etc. In other words, it’s the perfect domestic festival: you stay home from work, cook or contribute dishes of delicious food, celebrate your connectedness with as many of your favorite people as you can stand, watch a parade or two on TV, play some football, say “thank you” more than “please,” and nosh and nip and (when lucky) nap. Rinse and repeat. That’s it, easy as pie — except for all the setting- and cleaning-up, of course. There are endless variations on this theme and very few regulations, and that’s about as American as it gets. Oddly enough, it’s also one of the exclusively Yankee celebrations that requires the inclusion of French produce — namely wine and beer. As any regular reader of this blog knows (or can guess), we’re not here to discuss the former. In fact, when someone asks me what wine I want to drink with my meal, I say “beer!” Glib and annoying, yes; but no less effective, and no less true on the fourth Thursday of each November. Especially because, in this case, the beer of choice comes from the Pas-de-Calais region of northern France, near Belgium. Biere de garde, or “beer for keeping,” is a light-bodied, slightly malty, and moderately hopped farmhouse ale (similar to a Belgian ale, such as saison) with a strong herbal component that is, in the words of Garrett Oliver, brewmaster at Brooklyn Brewery and author of The Brewmaster’s Table, “brilliant with turkey.” The aromatic quality of biere de garde, which is usually sold in champagne-like bottles, perfectly matches all the various and savory qualities of the Thanksgiving Day meal — from the salty seasonings on the crunchy, browned skin, to the bouquet of veggie flavors in the stuffing and sides, to the rich poultry and game essences in the meat — and it makes everything taste juicy. Castelain is my favorite biere de garde. It’s like liquid stuffing: slightly sweet, bready, earthy, tangy, and the perfect accompaniment to nearly every ingredient on a plateful of the standard turkey meal — and, I would bet, it pairs well with the components of a non-standard one, too. Unfortunately, as I have come to discover over the past few years, it’s also hard to come by right now. Because biere de garde is typically brewed to be consumed as a summer beer, it’s not readily available the rest of the year. And despite the fact that Belgian-style ales are all the rage among microbrewers — for instance, the number of tripels on the shelf seemingly has trebled in the last six months — scant few Americans are brewing bieres de gardes, based on what I could find in my area, at least. It’s a shame, really, because I think they’re missing the boat (the Mayflower, as it were) when it comes to creating the perfect pour for the premiere American meal. So, following a failed attempt to locate the proper bottles to serve at my table this year, I decided to turn my deficit into a dare and set out to discover something that is comparable, in terms of flavor and comestible compatibility, easy to obtain, and brewed by our native sons and daughters. Following are the byproducts of this harvesting. One caveat, however: I have previously (and somewhat unwittingly) reviewed several of the beers that could serve as a stand-in for the Flemish habitue. And although I normally prefer to use this space to talk about novelties (or new-to-me’s, at least), I’m willing to risk repeating myself in order to introduce these quality quaffs to those who either have yet to be served or need a second helping. So, here goes. Enjoy! Sixteen, Avery Brewing Company. This limited-release saison proved to be a great summer brew and would, I imagine, hold up equally well at turkey time. Created in celebration of the brewery’s 16th anniversary, this Belgian-style ale features just enough unique ingredients, including jasmine, peaches, and honey, to make it a stand-out among its peer beers. Pouring out cloudy-blond, with lots of frothy foam, hoppy floral notes, and a nice balance of fruit and spices, it’s surprisingly less sweet than expected, slightly tart and dry, and assertive enough to pair with a range of flavors. Le Freak, Green Flash Brewing Company. As the name implies, and as I discovered this summer, this is one unusual farmhouse ale. A cross between an Imperial IPA and a Belgian-style tripel, it appears milky-light-brown, with citrus (grapefruit and orange) aromas and a potent whiff of alcohol. The IPA genes contribute some highly hoppy and dry-sweet flavors, while the tripel lineage confers a mix of herbs and spices and lots of carbonation. In August, it got down with a dinner of baked sweet (turkey) sausages and ears of fresh Silver Queen corn, and would no doubt prove tres chic with sliced turkey breast and sweet corn pudding. Biere de Mars, Brewery Ommegang. As I predicted I might in my review, I’m definitely going to place this beer front and center on my Turkey Day table. Similar to a biere de garde (and, brewed in Cooperstown, N.Y., the closest thing to an all-American I could find), this more robust amber ale pours out in an orange hue, with lots of spice and citrus notes, and a tart, dry, and, well, funky taste due to a key ingredient: Brettanomyces bruxellensis, or “Brett,” a wild yeast used in secondary fermentation. This late-stage infusion apparently imparts a fruity, peppery, musty bite that, like a dry Chardonnay, will kick-start your tastebuds between forkfuls for an “out of this world” experience. Saison Athene, Saint Somewhere Brewing Company. It seems fitting that this medium-bodied ale, brewed in Sarasota, Fla., is one of the most citrusy saisons (with pronounced grapefruit highlights) that I’ve ever opened. It’s also one of the sweetest. Both are qualities that I think make it an ideal partner for a meal that includes a variety of lighter-flavored ingredients, such as cranberry sauce (especially if it includes orange peel, the way my grandmother made it), and squash, turnips, and sweet potatoes. It is just dry and sour enough, too, that I’d bet it would do the Schuhplattler with a side of sauerkraut, which is a Maryland must-have. La Merle, North Coast Brewing Company. Here’s another farmhouse ale that, with its golden complexion, racy carbonation, and earthy, yeasty-biscuity flavors, would serve as a refreshing and versatile table-mate for Tom and all the fixings. Last week I tried it with pork chops baked with apples and acorn squash and discovered that, because the fruity aromas and hops bitterness are less dramatic and more understated here than with other saisons, the spice notes are more noticeable and draw out the sweet and herbal qualities inherent in such a piquant meal. Gobble, gobble! Coup de Boule, The Brewer’s Art. This is a traditional Belgian dark ale spiced with cardamom, cinnamon, and saffron that pours out coppery gold with a lively head of aromatic foam. It’s mildly spicy, with hints of lemon and malty sweetness, and a taste that reminds me of an apple pie. Seems appropriate, doesn’t it? Moreover, because dark ales are considered a good pairing for game-based dishes, I thought this relatively new brew from the Baltimore-based (and Esquire‘s favorite) brewpub would be a strong choice for those who favor dark meat and hearty stuffing — like the kind my mom makes, with apples, raisins, and sausage. And, oh yeah, save a little for dessert, too. 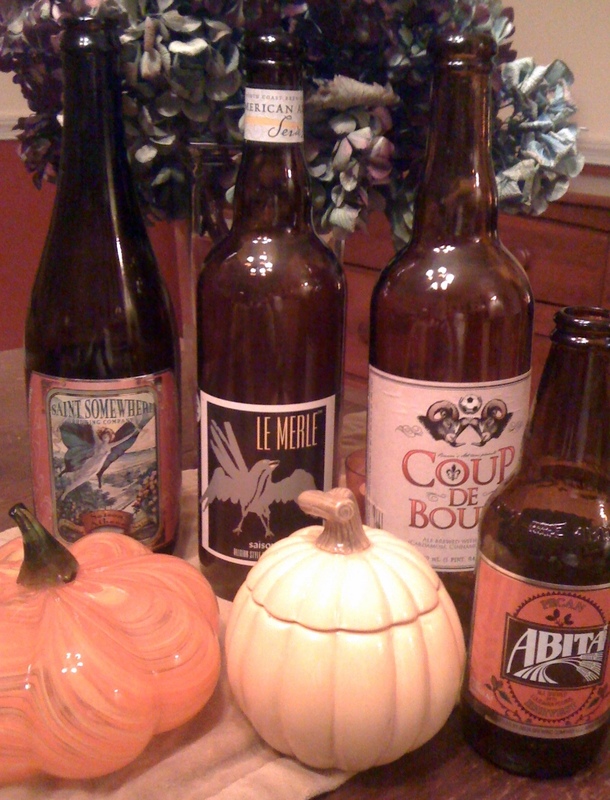 Other American-made French-style beers that I’ve read about, figured would be ideal, but couldn’t find on the shelf in time for this posting include Fluxus (Allagash Brewing Company), an ale fermented with sweet potatoes and black pepper — is there a better-sounding second-best beer for the Thanksgiving meal? — Fuego del Otono, or “Autumn Fire” (Jolly Pumpkin Artisan Ales), an amber ale and one of the few bieres de gardes to be released in the fall, and Garde Dog (Flying Dog Brewing Company), a conventional biere de garde from an unconventional brewery. I’d also recommend the Pecan Harvest Ale from Abita. Although I’m not a fan of the ubiquitous, often uniformly flavored “autumn ales” that seem to be growing in popularity among brewers, I was intrigued by the possibility of this one, and enjoyed it with a slice of fresh shoofly pie. Mildly flavorful, dry rather than sweet, and slightly nutty, I imagine it’s cracking good paired with its eponymous pastry. So, there you have it, a selection of six-plus native stand-ins that, though not quite achieving la perfection, nonetheless will squash your desire to serve grape-flavored libations at the dinner table this holiday — and that’s something for which your guests will be thankful. But keep the wine glasses out — you’ll enjoy the beer better if you don’t drink it straight from the bottle. As always, talk turkey here and tell us what you think. Have you tasted any of these beers? Are there other American-made bieres de gardes, or different beer styles altogether, that you prefer to serve with your Thanksgiving meal? Let us know by leaving a comment below. And be sure to visit (and join) the Scribbleskiff page on Facebook (find it here), where you can partake in wall-to-wall conversations, find additional information and suggestions from readers, and more. Originally posted on November 24, 2009.